Let's assign new name to the Variables or Functions manually. 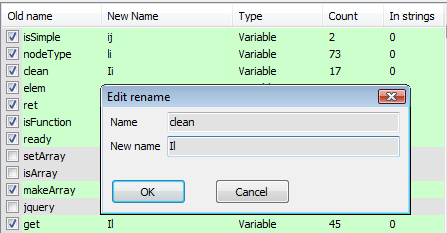 If you want to change Variable or Function you should double-click the required name or right-click the required name and select "Edit Name" in the context menu. "Edit rename" dialog will appear. You should type new Name of Variable or Function. Warning! Use this option with caution. For example, automatic renaming of global or interface variables may cause a script malfunction, so in most cases it requires manual renaming.